This is the second part of the Mediterranean style apartment in Surat. 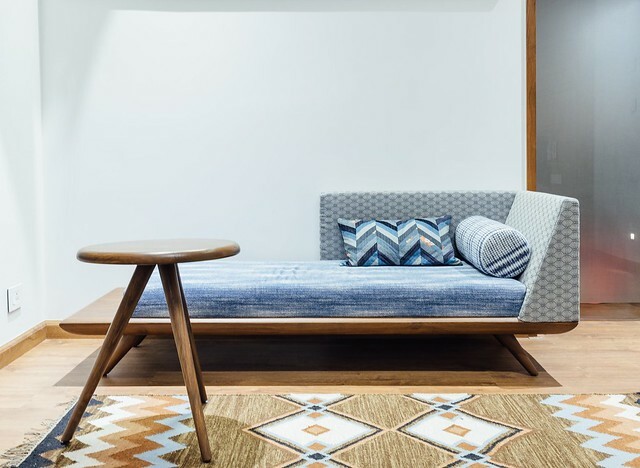 The focus of this post is on the furniture in the home – designed by Design ni Dukaan. 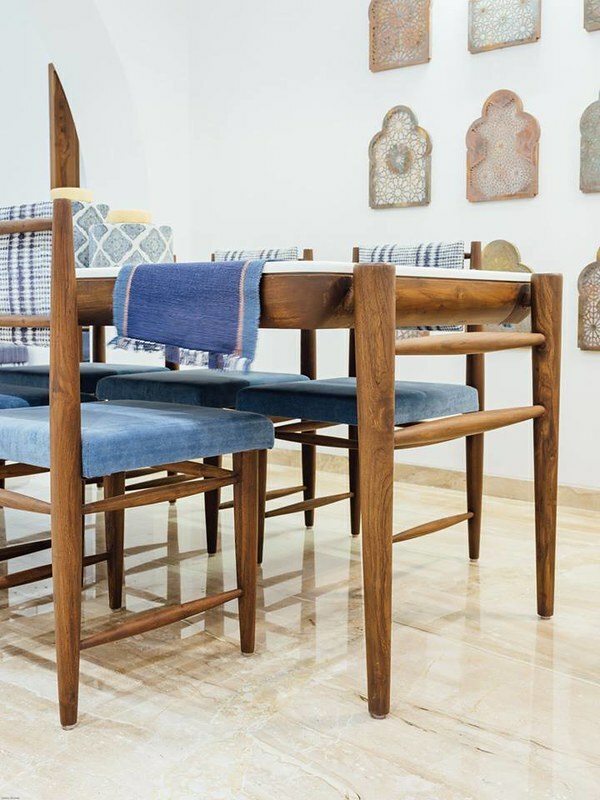 Furnishings and furniture used in the house are undoubtedly the unsung heroes of this project – the two key elements that silently give it a coherent look true to the Mediterranean style without stealing the limelight. This is perhaps the first home tour I’m featuring that has two parts. 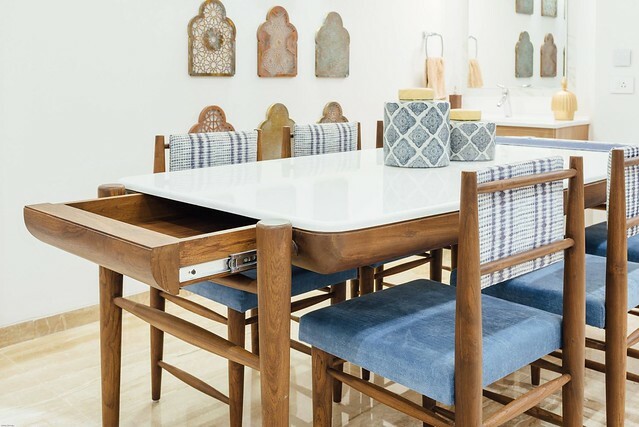 The reason is I wanted to emphasize how important it is to consider furnishings and furniture as part of the interior process than as an afterthought. 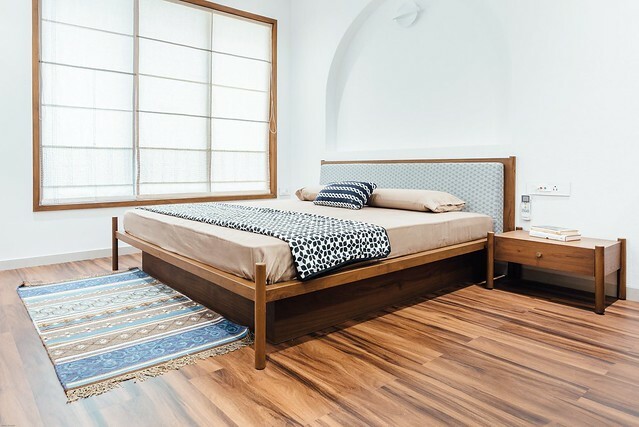 And, this project nails that aspect and shows the vision of your architect/interior designer for the end product as a whole and not just the wardrobes/storage and the false ceilings. 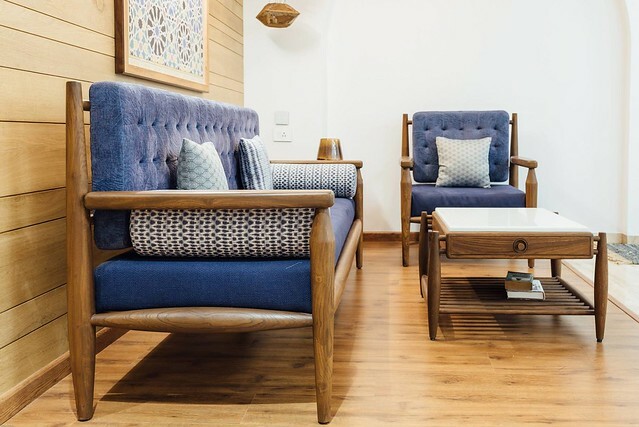 When you look closer, you will see that the house wears a coherent look – of teak wood furniture and Indigo colored furnishings. 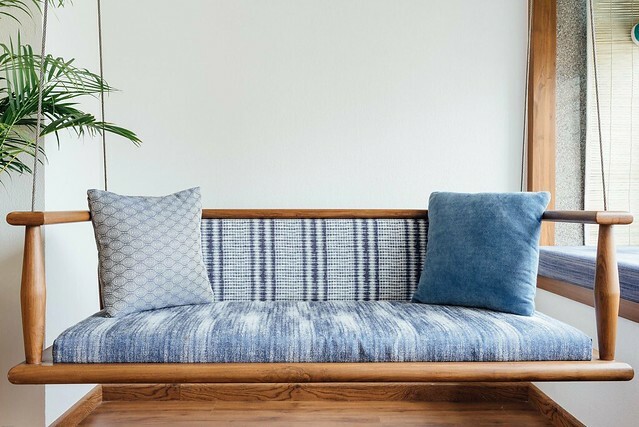 Every piece of fabric from cushions to seat pads and curtains come from the same color family: Indigo. 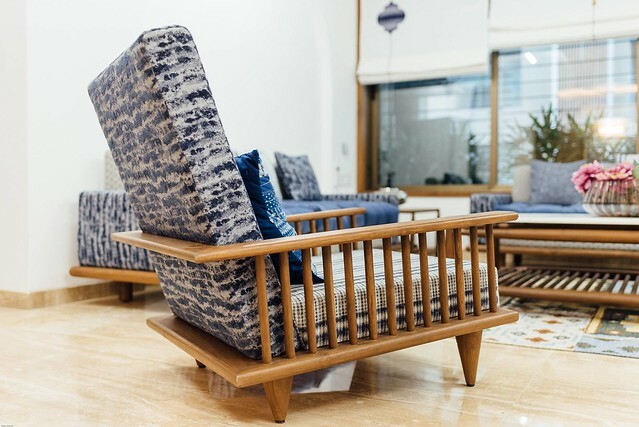 Similarly, every piece of furniture is made of teak wood using the same design principles – a straight clean look that reflects old world charm with rounded edges. There is no deviation here and no traces of any old furniture, whatsoever. 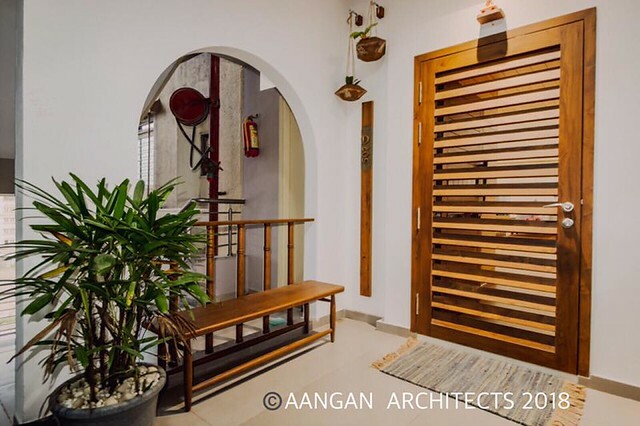 We were offered a very interesting project by AANGAN Architects Surat. 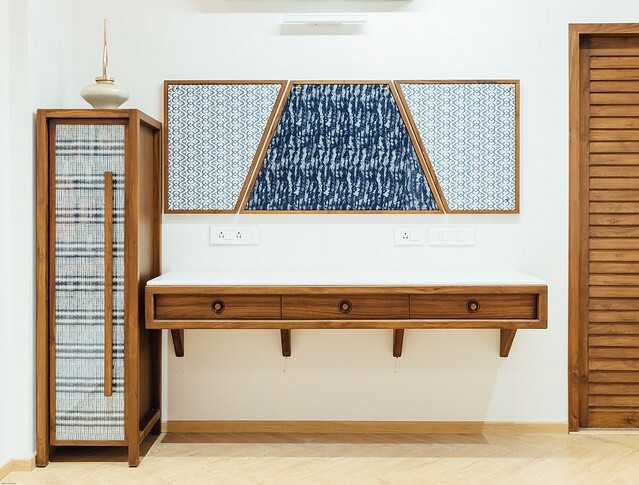 The brief was to create simple, functional and well-detailed pieces in teak and indigo for one of their projects. It was one project where we were offered to do most of the furniture in the whole house. It was a very interesting exercise as we had to introduce controlled nuances in all the pieces for different spaces. This made sure all the furniture in the house belonged to the same family and yet have a distinct character for each detail. Because the decor was so minimal we worked only on the utter simplicity of the details. 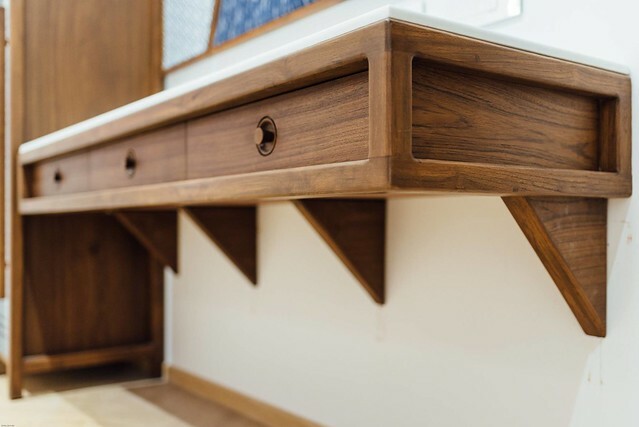 The design process and manufacturing was done in 4.5 months and the pieces were installed on site in 3 days. 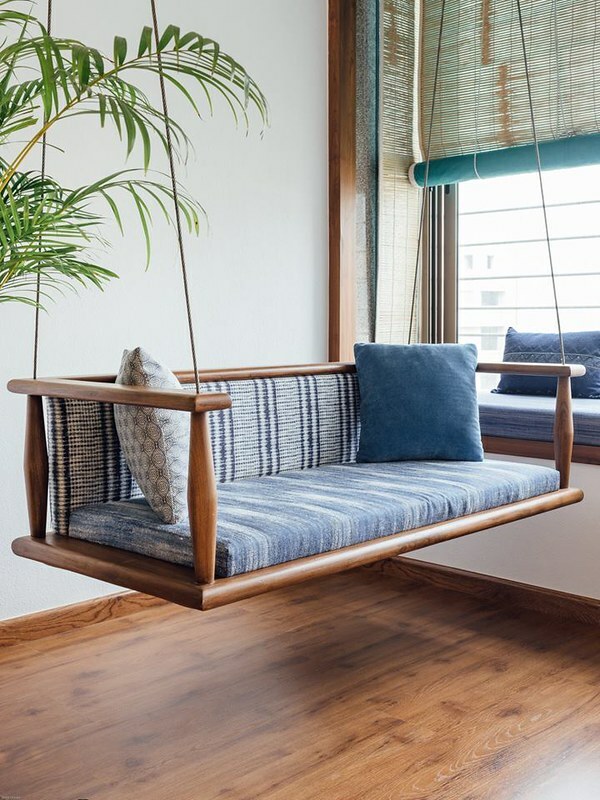 The same kind of fabric is used on all furniture from the seat covers for the dining chairs to the jhoola seating in the balcony and the fabric sandwiched on wardrobe doors. 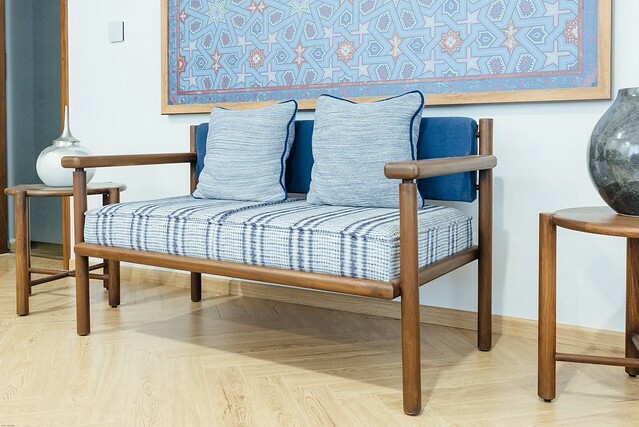 When someone utters teak wood or rose wood furniture, the first thought that comes to mind is one with intricate carvings on handles and legs that was a nightmare to clean, no matter how great it looked. It takes great restraint to keep it simple. I love the fact that all the corners have rounded edges. The clean lines make it simple to clean and maintain. This house is a tremendous inspiration in furniture design. 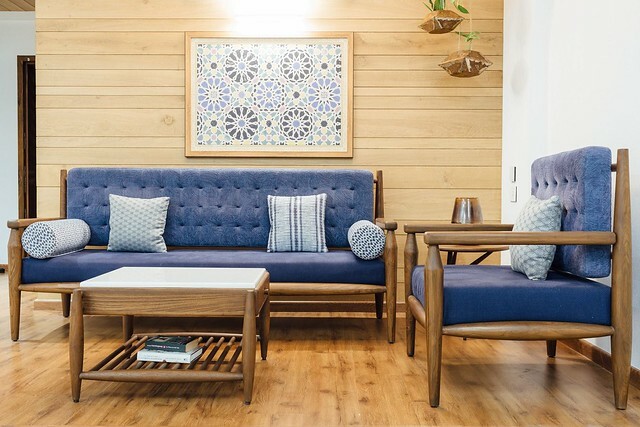 There are several pieces of multi-purpose, space-saving furniture here that can be used as day beds or seating by the day. 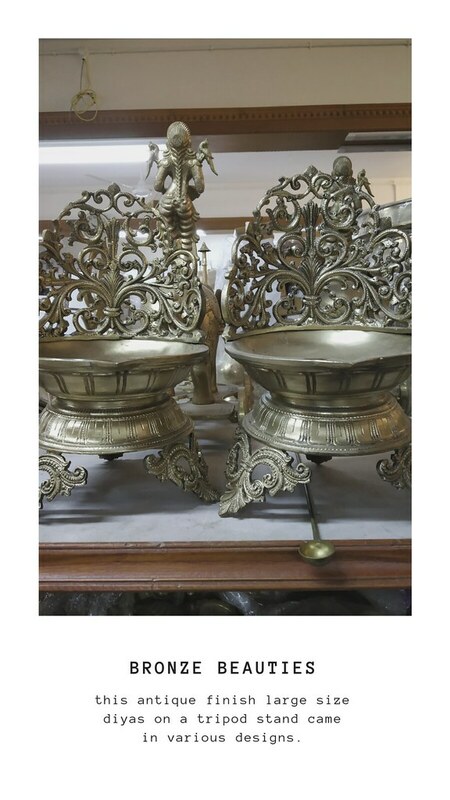 This sleek piece, for instance, mirrors the traditional style of low baithak – a more informal seating arrangement. Sandwiching a piece of fabric on doors continues the theme and is different than solid laminated doors. It gives it a rich look when it is silk fabric, but this one is loyal to the theme. 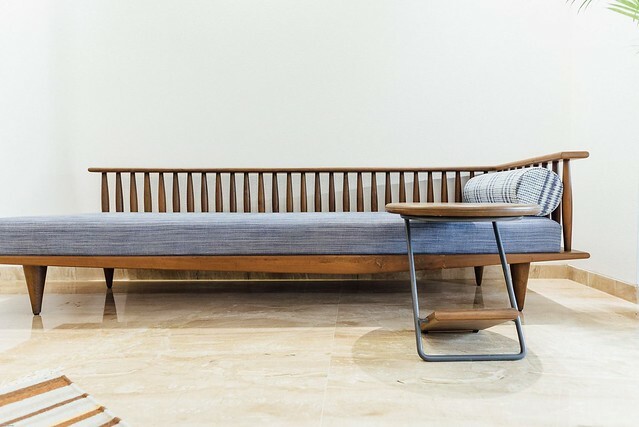 About Design ni Dukaan: We are not into commercial manufacturing of furniture and only take up projects which involve designing and execution. For every project, we understand the site, the architects concepts, the clients needs and habits and design pieces contextual to all this framework.